In the previous blogs, we introduced Chef and setup the Chef Server, Workstation on EC2 instances. Please refer to the earlier blogs here. In the blog, we will look into bootstrapping EC2 instances with Chef. The bootstrapping process involves setting up a Chef Client on a node. Chef Client Communicates with the Chef Server to receive directions for its own configuration. After the client receives the policy, it applies to the node to ensure the client is configured as per the directions of the server. Knife-ec2 is official Chef Knife plugin for EC2. This plugin gives knife the ability to create, bootstrap, and manage EC2 instances. The plugin provides the following sub-commands. Use the — help flag to find specific command options. On the workstation, create the required cookbooks and upload to the Chef Server. A role is a way to define certain patterns and processes that exist across nodes in an organization as belonging to a single job function. Each role consists of zero (or more) attributes and a run list. Each node can have zero (or more) roles assigned to it. 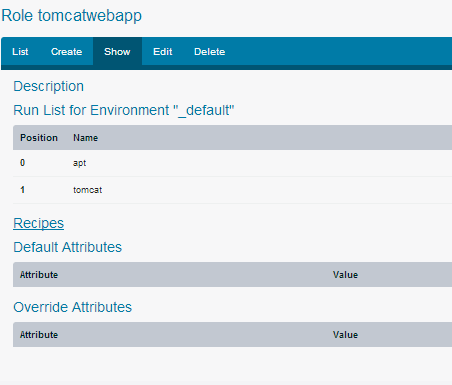 We will create a “tomcatwebapp” role and then use it bootstrap an EC2 instance. the command will open up the vim editor, edit the file contents as below. Login to the Chef Server and navigate to the Roles tab, you must see the role we created. Now we are all set to bootstrap an EC2 instance with the tomcatwebapp role with the following command. A m1.medium EC2 instance will be launched in the ap-southeast-1a zone with the given group and key name. The role ‘tomcatwebapp’ will be applied to the instance as well. When the role ‘tomcatwebapp’ is run against the node, the configuration details of that node are compared against the attributes of the role, and then the contents of the role’s run list are applied to the node’s configuration details. When a chef-client runs, it merges its own attributes and run lists with those contained within each assigned role. On the Chef Server, we will be able to list the nodes and see the node with the tomcatwebapp role. In the next blog, we will introduce creating cookbooks and recipes.